Ever since Natasha Richardson suffered a severe head injury on my mother’s birthday, March 16, 2009, I think about her every time I hear about someone getting banged around. I can’t get her out of my mind. I just feel her death was so senseless. This world-renowned talent, and a beautiful mother, wife, and daughter, died at such an early age (45) because of two lousy decisions while taking a beginners ski lesson. She wasn’t wearing a helmet and refused medical attention when the paramedics were called in after her fall. Three hours later Natasha was in critical condition and she lasted only two days more. An autopsy revealed that the cause of death was an epidural hematoma due to the blunt impact to her head. I know of a new invention that “might” be a life saver in this type of circumstance. Before I tell you about it, I want to make a disclaimer that frees me of any legal obligation for my remarks. In no way do I mean that this new invention is going to be a cure all. I am merely suggesting that the new invention may be a good option to monitor any head injury. 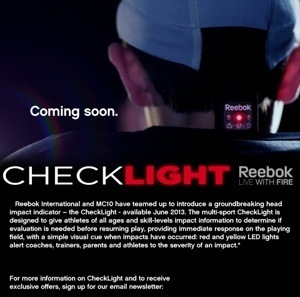 Reebok and MC10, have joined forces to introduce a new impact-sensing cap that blinks yellow or red if you suffer a moderate or severe blow to the head. Blows to the head are pretty common to millions of girls and boys who play hockey, soccer, lacrosse and other contact sports. The CheckLight is a washable beanie that has an electronics module tucked inside it. It can be worn under a helmet for football or hockey, or by itself for soccer and other helmet-free sports. It will sell for about $150. Reebok makes the beanie and MC10 developed the flexible and stretchable electronics. 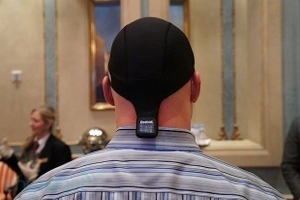 Sensors in the cap — a tiny accelerometer and gyroscope — measure the head’s forward and twisting movements. The sensor can be used for about 13 hours continuously and can be recharged with a USB cable. The total number of hits can be read when the battery is recharged. Definitely look into this new product. Active people wear all kinds of protective gear. Start from the head down.